Even the best excuses don't feel as good as success. Tons of people have been inspired by what The Secret has to say about the "law of attraction" and our ability to manifest what we want in our lives by our thoughts. It's a bit simplistic in that while I agree we shape our own reality by what we think, the book leaves out the reality of the hard work that actually goes along with those thoughts. I find this book (and all of it's spin-off products) fascinating as a marketer. There's nothing new here but with smart marketing they've given "The Secret" almost a cult following with discussion groups, other courses, blogs, etc. devoted to it. Worth reading if for nothing else than to see what all the fuss is about. Registration is now open for the February / March Live Staging Diva TeleClasses. I only take 15 students in a conference call. All notes are emailed to you in advance. You get a phone number and password to join your fellow students and me in the live calls on the 5 designated evenings. Don't worry, I'm still accessible but with over 500 emails a day, I need help. If you send me something that needs my attention, Sandy always forwards your message to me. Anyone can put initials after their names and call themselves a professional home stager, there are no requirements or licenses to do so. Look for a trainer that has a proven track record of success as a home stager, not just as an instructor! I don't know about you but I always get revved up in January. The New Year always brings a feeling of being able to make a fresh, new start. I love cracking open my brand new day timer and plotting my projects and meetings on its crisp pages (the coffee stains and smudges will come soon enough). This year I'm especially nostalgic because this is the 5th anniversary of my first home staging project for a client. Who knew it could have led to doing hundreds of homes and international recognition? It's also the 3rd anniversary of the first Staging Diva TeleClass and there are now 700 Graduates worldwide and many others who have read my two books, enjoyed a few classes, or business coaching with me to help them turn a non-performing staging company into a profitable one. I'm deeply grateful to all of you for letting me be part of your own journeys of reinvention. I believe life is the adventure we make of it and I want all of you to go out there and follow whatever dreams you may have. For those of you who wrote wondering about my HGTV shoot at the end of December, it was so much fun! You can read more in the last article in this newsletter. I hope you find the content of this issue of Staging Diva Dispatch helpful. I welcome your feedback and/or new story ideas! Best wishes for the New Year and may all your dreams come true in 2008! P.S. If you missed the Preview session I ran in January, you can listen and download the F/REE recording here. There were excellent questions from the audience about marketing, the future of home staging and more. Debra Gould Teaches Staging on HGTV show! Home remolding, design and decorating have become national pastimes in part because of the phenomenal success of Home & Garden Television or HGTV. Shows such as Designed to Sell, House Doctor and Sell This House allow armchair decorators a way to indulge their passion. For all the viewers of these shows who say to themselves "I can do that" or "I want to do that", I say it's a New Year, what have you got to lose by trying? If you had told me five years ago that I'd be making multiple appearances on HGTV and a bunch of other networks, or that I'd be in all the major magazines and newspapers I have been across the US and Canada, I would have thought you were crazy! A number of Staging Diva Graduates have also found themselves on HGTV including: Victoria Willits, Suzanne Paro, and Kris O'Neill. Others, like Jenny Olsen have written their own newspaper columns and been profiled in magazines. We all went from dreamy HGTV addicts to actually being the people you see on shows because we took action to follow our dreams. 2008 is a brand new year full of possibilities and a chance to start over from wherever you are now in your life. Was it Einstein that said, "opportunity meets the prepared mind"? In other words, if you tell yourself something is impossible then it WILL be impossible! When I started I was scared about whether I could pay my mortgage and support my family. I was scared no one would understand what home staging was, that I'd look silly, that I didn't have a degree in interior design, that no one would hire me. But I plunged on anyways and fought the urge to give up many times in that first year! The Staging Diva Home Staging Business Training Program provides individuals with an opportunity to combine a passion for decorating with the tools you need to make m0ney as a home stager. I focus on the business side of home staging rather than teaching you "decorating," because I believe anyone considering this field should already have a natural talent for decorating. If you have no taste and no sense of what looks good in a room, I don’t believe anyone can teach you that-- especially in a day or two. Instead, I emphasize best business practices, marketing strategies and pricing of services, and all the things you need to take your natural talent and turn it into a lucrative business. Learn more about how to stop "watching" and start "doing"
Think of a vignette as a detail or 'still life.' It should have an attractive composition. If you’re staging a house you’ll be creating lots of vignettes for your clients. Don’t forget to photograph them when you’re shooting the overall room. You might zoom in close on the arm of a chair with a throw nicely arranged and a portion of a painting in the background. Perhaps it’s the three figurines you carefully arranged on the end of the mantle. Maybe it’s the book and lamp on a night table with only the edge of a pillow sham visible in the background. It could be towel rolls on the edge of a tub beside some candles. Notice the before shot (above left) isn't portfolio-worthy. While the planter I created for one of my staging projects looked great on the kitchen counter, the photo of it doesn't work because of the distracting plugs on the wall and the window. Not to mention it's a bit fuzzy! However in a software program called Adobe Photoshop, I created the detail shot (above right) by cropping, sharpening the original image and adjusting the lighting. The image is now perfect for laying out an interesting brochure or web page. Vignettes tell a story, they set a mood. They are everywhere in a staged home. Don’t forget to capture these little gems and pay attention to creating an interesting and attractive composition when you’re shooting or cropping them. For more portfolio ideas check out the Staging Diva Ultimate Portfolio Guide. By the way, when you join the Staging Diva Directory of Home Stagers, this is the kind of retouching work we do on your photos for you. Congratulations to Staging Diva Graduate Judi Collins of Superior Home Styling (Australia) who launched her website within a few months of completing the training program. Judi used the Staging Diva Ultimate Portfolio Guide for help. She writes, "I received my Portfolio Guide immediately and found your advice invaluable. My web designer was pressuring me to use stock photos but you've convinced me to maintain my integrity and wait to get some awesome photos of my own. Your training is practical, motivating, real-life stuff. It demystifies a lot of technical subjects, while making me feel proud of my staging ability!" Congratulations to Staging Diva Graduate Leigh Luck of Revitalize Design (OR) who quit her high stress executive position of 9 years in July, completed the Staging Diva Program in August, got married in October and has launched her new staging business, saying, "Well now, it is my turn to do not only what I am good at, but what I love!" She's one of many new members in the Staging Diva Network Online Discussion Group. Congratulations to Staging Diva Graduate Dane Caldwell of 2-Hounds Design (ON) who turned a staging project referral I gave her into a kitchen redesign including new granite counters before staging the whole house. It's been a pleasure to watch the amazing business progress Dane has made since taking the Staging Diva Program less than a year ago. She's positioned herself very clearly as a home staging expert and has shown real leadership in the industry already. In our last conversation Dane said to me, "without a doubt you saved me at least a year of struggle because of the information you shared so candidly in your training program." In October I received a request to teach a program from the Professional Development Institute in Maryland. Not wanting to travel, I passed the lead on to Staging Diva Graduate Allegra Shann of Styled and Sold, LLC (MD). She's now teaching their three-hour continuing education course for Realtors, called "The Benefits of Home Staging." What a great way for Allegra to establish her expertise as a stager and spread the word to Realtors on why they need our help decorating their clients' homes. This is not the first time I've been able to forward a teaching or guest speaking opportunity to one of my Graduates. I hear about these because of all the traffic I get to my websites. What have you got to lose by joining? 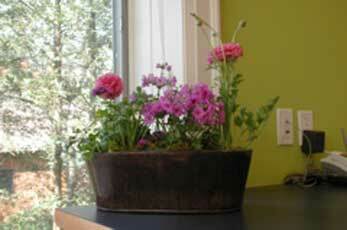 The Staging Diva Directory of Home Stagers welcomes Laura Kakoschke of HUNTER LAKE Home Staging and Design. Congratulations on getting your portfolio together and putting yourself out there for homeowners, agents and the media to find as we head into the busy 2008 spring real estate market. PLUS, being included in this newsletter gets you a F/ree home on StagingDivaDispatch.com (the more links I provide you with, the better for your business growth). Put it another way, I'm the most receptive editor you'll ever approach for publicity for your business. It's time you take advantage of that! I recently finished an all day shoot for a new HGTV show to air this spring, "The Decorating Adventures of Ambrose Price." 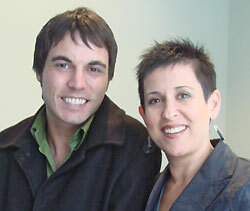 Ambrose was one of the contestants on the last season of HGTV's Designer SuperStar Challenge. In one of the 13 episodes of this new show, I take Ambrose under my wing to teach him about how to stage a home. We visited three supposedly staged houses just before Christmas and I talked through what was done right and what was wrong in each one. shown here with host Ambrose Price.